HAVANA — MAYBE it was the Robin Thicke music video playing on a half-dozen flat-screen TVs, or the black-and-white image of the Brooklyn Bridge splashed above the V.I.P. area, or perhaps it was just the nightclub’s name: Sangri-LA. All I knew, as I sipped my $4 rum, was that this was not the Cuba of Fidel Castro’s 1959 revolution. Nor was it the Cuba I first visited in the late 1990s with my wife, who is Cuban-American. That was a nation of grinding scarcity; nearly everyone we met asked us for something they needed — soap, pens, money, even the sneakers on our feet. This Cuba, which I encountered on a recent weeklong visit, felt like a country struggling with its wants and jumpy in its eagerness to catch up with the world — as epitomized by this small but flashy nightclub, privately run, in the basement of a mansion in the capital’s leafy neighborhood of Miramar. Sangri-LA was in some ways a step back to an even more distant time; the bartender confirmed it had been a club in the ‘50s, too. But it also looked like a strange step forward into Cuba’s more unequal future. The stratification that emerged after the Soviet collapse, when Cubans with tourism jobs or relatives abroad surpassed their peers, seemed to be accelerating, and while the inequality was nowhere near what could be found in pre-Castro Cuba or the United States, I wondered what Cubans thought of the new have/have-not dynamic rising through the cracks of Communism. So I went elsewhere, into many of Havana’s neighborhoods, looking for discussion — and indicators. Every country has them, the little details that hint at a culture’s priorities and direction, but in secretive Cuba, “the land of topsy-turvy,” as one American historian called it back in 1910, little things like a phrase or a fad often carry special weight. These days, with Fidel Castro on the sidelines as Raúl Castro gradually tries to modernize the economy with a dash of private enterprise, the tide of taste has turned. All across Havana, government symbols are out. New desires are rushing in. The teenagers on Rollerblades racing down Paseo del Prado, the wide boulevard that divides touristy Old Havana from Central Havana, the city’s urban core, paid no attention to the pasty foreigners walking by. The scene suggested two things. One, the lag time between global and Cuban trends is shrinking: While it took more than a decade for the tight Lycra craze to reach Cuba — with crazy abandon — it seemed to take half that time for in-line skating to go from out of style in Miami to in style here. Two, hustling seems to be in decline. A decade or so ago, I couldn’t have walked more than a few feet without being accosted by young men trying to sell me cigars, a prostitute or a meal at a private restaurant. The jineteros (or jockeys), as the hustlers were called, always struck me as a byproduct of economic desperation and the relative newness of tourism. Most tourists back then were first-timers. And many hustlers were proto-capitalists who had taught themselves English, German or Italian just to earn a few dollars in tips. But now, except for a lazy solicitation or two, no one seemed to bother. The energy of the young was focused elsewhere. Maybe the police had really cracked down, always a possibility in Cuba, but other factors seemed to be in play. 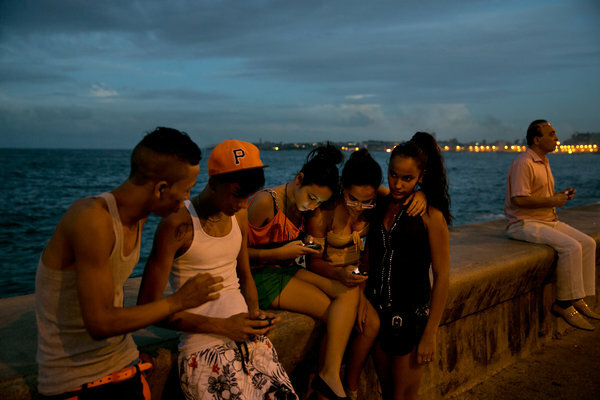 On the Malecón, Havana’s seaside esplanade, cellphones had suddenly become common and magnetic. Raúl Castro granted ordinary Cubans the right to have them in 2008, and use has exploded. Sort of. When I ran across Jenifer García, 15, and Ángel Luis, 21, lying on the sea wall, they were using a cellphone for music. Mr. Luis said he had paid $80 for the old BlackBerry Torch with a cracked screen, carried into Cuba by a friend who visited New York. He mostly uses it to listen to Marc Anthony; Ms. García said she was partial to Pink Floyd. Indeed, the easing of travel laws by both Cuba and the United States in recent years has created a heartier commercial exchange and a new relationship to technology. While Americans fret about the isolation our screens encourage, Cuban families (those who can afford Internet fees of $4.50 an hour) often gather around a single laptop at a hotel. DVDs and television programming from Miami — news and entertainment, on thumb drives — have become part of many families’ weekly routine. But not everyone is connected. I didn’t see many cellphones in the poorer sections of Central Havana. What I did see were men pulling majestic colonial wooden doors out of an old building, and putting them on the back of a truck. They were hauling off the neighborhood’s last markers of past beauty and grace for a new restaurant in another area. 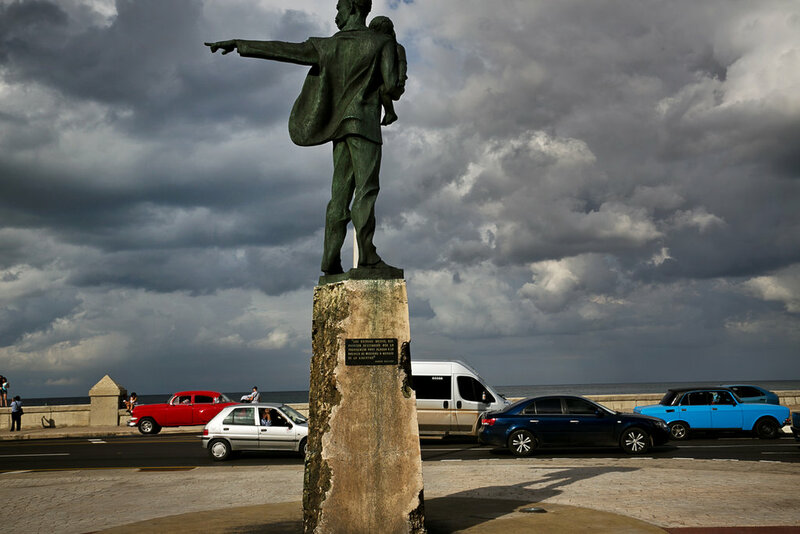 A short drive west in the nicer residential neighborhood of Vedado, at the corner of a park named after John Lennon, lies one of Havana’s most distinctive old homes. Reddish and run-down on the outside, with a glass cupola that looks like a rocks glass turned upside down, it used to be owned by a wealthy family with eccentric taste. Now 14 families live there, about 50 people crammed together in what amounts to a tenement. Two doors down, behind a high black fence, is a high-ceilinged, expansive colonial home with chandeliers inside, and outside a kiss of fresh yellow paint. The owners, who inherited the property, said they rented out its rooms to tourists. 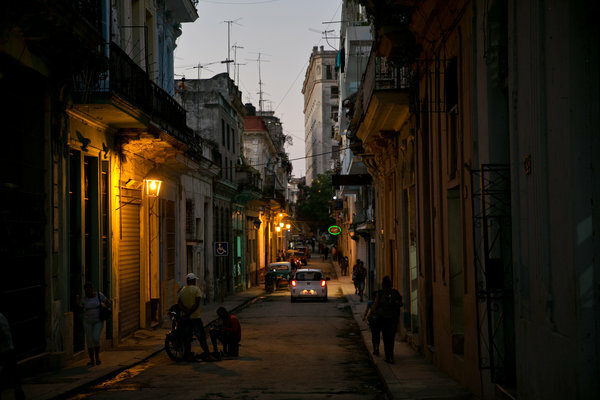 Welcome to Cuba’s widening real estate divide. I asked Aida Pupo, 45, squeezed into a back corner of the reddish mansion, if her neighbors’ wealth bothered her. She said she lived with three generations of her family. The ceiling of her kitchen forced anyone over 6 feet tall to duck. But she didn’t care. A little frustrated but mostly acquiescent, Ms. Pupo belongs to what the journalist Marc Frank describes as Cuba’s “grey zone.” In his new book, “Cuban Revelations: Behind the Scenes in Havana,” he argues that these are the Cubans whom Raúl Castro has sought to win over with his efforts to modernize the economy. There are no public opinion polls to test whether it’s working. Members of the revolutionary elite (high-level government officials, artists who make money abroad) are clearly benefiting, with investments in restaurants and homes. The nouveaux riches (running successful small businesses) are also at least somewhat satisfied. In Miramar, the wealthyish seaside suburb where most foreign embassies can be found, I stopped at a used-car lot where the price list on a bulletin board might as well have been shooting nails at customers: A 2010 Volkswagen Passat for $67,500? A 2006 Toyota Corolla for $39,724.80? Those Cubans working for reform from within insist that government officials are still learning how to be responsive to the public instead of just the party. But Cuba’s response to inequality is disjointed partly because the country is struggling with what kind of equality it really wants. And therein lies the challenge: are those young people with Rollerblades and cellphones, or those with new cars, a sign of the equality Cuba wants, or not? Her attitude reminded me of a line from Graham Greene’s 1958 novel “Our Man in Havana”: “It is a great danger for everyone when what is shocking changes.” That seemed to capture how many Cubans feel these days. It certainly helped explain why no one at Sangri-LA would talk to me. And yet Cuba is still Cuba. At Sangri-LA, along with the signs of rising demand for the shiny and new, there was as much shouting and hugging and gossiping as I had seen at countless state-owned venues, and in neighborhoods at every economic level. Damien Cave is a correspondent for The New York Times covering Latin America and the Caribbean.